My friends wrote a book. Now, when your friends write a book, you’re obligated to like it; are you not? Well, you’re obligated to at least read it. Then, you know that you’ll have to be honest and tell the world what you really think of it-if you are a true professional, or at least someone who wishes to remain in integrity. This can obviously, be risky. But, being one who takes pride in taking the high road whenever possible, (and suffering the consequences if necessary), I have to say…that I love this book! I Married a Nutritionist: Things I've Learned that Every Guy Should Know is a delight. 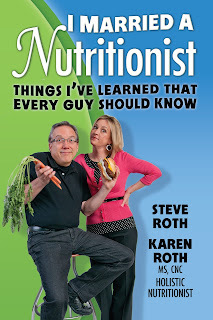 My friends Karen and Steve Roth did a wonderful job and created something really special with this book. It is packed with useful information, some of which may already be familiar to you but some of which will no doubt, take you by surprise. For example, most people will recognize that soda is simply empty calories, devoid of any nutritional value and that the sugar in that soda will rot your teeth while its calories will get you fatter than fat. But Karen takes it a step further and explains that the sweetener used in most American soft drinks is “made from high fructose corn syrup which is a man-made compound derived from genetically engineered corn” (or, GMO-which stands for genetically modified organism and usually refers to foods that have been genetically engineered for reasons unrelated to health or nourishment.) She goes on to explain what GMO foods are, how they affect our bodies, and how prevalent their use is in our food supply. But did you know about the correlation between drinking soda and osteoporosis? This applies to both “regular” and diet soda by the way, and to both men and women. Karen goes into depth explaining this connection and gives some healthy options for soda “addicts” as well. 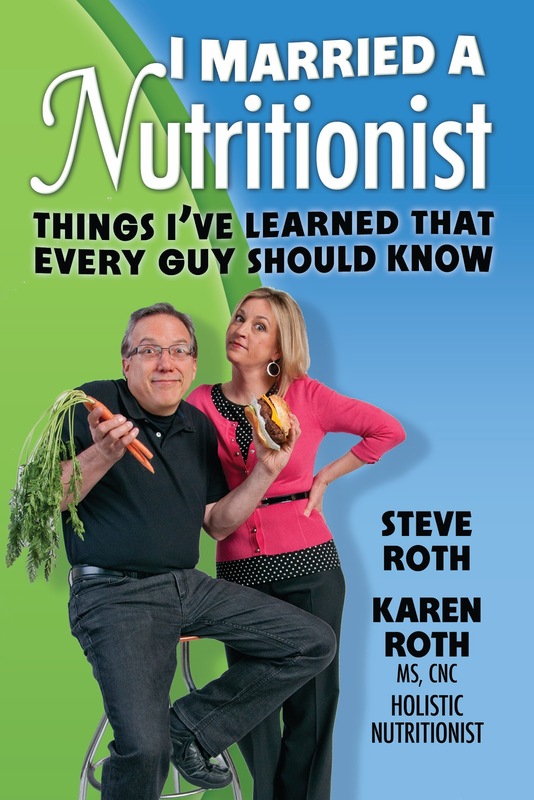 I Married a Nutritionist is cleverly written in a question and answer format and targets, as its name suggests, your average Joe-the guy who is learning how to balance living a healthy lifestyle with his desire to just “eat all the stuff that guys like to eat.” Steve’s voice brings fun and a real sense of humor throughout the entire book. Lucky for me, I have this opportunity to tell you all about I Married a Nutritionist, and encourage you to read it and share it with the men in your life. It will help them make better choices and educate them about healthy living in a way that goes beyond suggesting they start cutting back on the beer a bit. You will both get a good deal more than you bargained for in terms of education. Recommendations given in I Married a Nutritionist can really make a difference in your life and the life of someone close to you and you'll forget you're being educated because it's so much fun to read! It makes a wonderful gift for any guy who is interested in looking and feeling better (I'm sending a copy to my nephew, away at college) and it's great for any guy who is about to discover that he’s interested in looking and feeling better-right ladies? If you'd like to see other great reading recommendations, check out the Recommended Reading page on my website. WANT TO USE THIS ARTICLE IN YOUR EZINE OR WEB SITE? Fitness expert and integrative performance coach Jini Cicero, CSCS, teaches intermediate exercisers how to blast through plateaus to create incredible transformations. Are you ready to take your fitness to a whole new level? Find out now! Take Jini's "Are you Ready?" Quiz at www.Jinifit.com. © 2011 Jinifit, Inc. If you use the article you are required to activate any links found in the article and the by-line. Please do not use this article in any publication that is not opt-in (spam).